A while back Apprising Ministries brought out that sadly today there are so many in the apostatizing evangelical community who are burying their heads within the spiritual sand of whatever offshoot—rooted in the semi-pelagian Church Growth Movement—it is that highjacked their particular brand of Christian sandbox. So while apostasy sweeps through the landscape of the visible church they remain content to think everything is wonderfully progressing toward some utopian unity as they each follow their own personal Pied Pipers, whether it be PDL Pope Rick Warren or Rob Bell, the Elvis of Emergence Christianity, or Joel Osteen for his brand of Word Faith-lite. The sad fact is that mainstream evangelicalism in America today is nauseatingly lukewarm. And far too many evangelical leaders have been unwilling to take serious theological stands that would require the Lord to back up His Word or else they would personally be destroyed. Yet to do so is not presumption, rather it is actually true Biblical faith that pleases God. That so-called Bible religion in our times is suffering rapid decline is so evident as to need no proof. I have observed one significant lack among evangelical Christians. The great deficiency to which I refer is the lack of spiritual discernment, especially among the leaders. How can there be so much Bible knowledge and so little insight? Surely one of the greatest needs is the appearance of Christian leaders with prophetic insight. Unless they come soon, it will be too late for this generation. O, but how much easier it is instead to tell ourselves that “we must work for unity in the love of God” than to look a professing Christian in the eye and inform them the Lord has not sent such as these bringing together the various pillars making up this growing ECoD into our midst to teach counterfeit versions of Christianity. I warn you do not listen to their dreams of one big happy family of “Christians,” which even includes reuniting with the Church of Rome and considering its long apostate Roman Catholicism a legitimate form of Christianity. God did not send such as these with their message of man-love because if He had, then the Reformation was a lie. 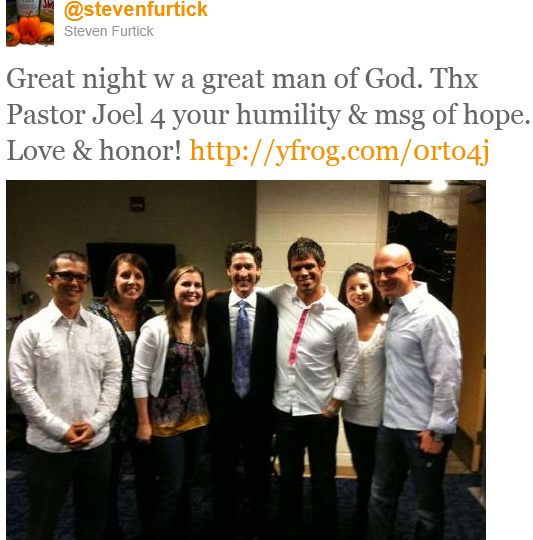 Click the link and you’ll be taken to a picture of a smiling Furtick, who is the next generation of PDL-type preaching, with his arm draped around Joel Osteen, who is one of the next generation—and most popular—preachers of Word Faith heresy ala Kenneth Copeland; you know, of “the Born-Again Jesus.” And Joel Osteen Blesses The Mormon Church as Christian. Know this: In Osteen’s case a message of “hope,” “love & honor” does not “a great man of God” make; because great men of God don’t de-emphasize the Cross and tell you lies in the Lord’s Name.